Throw Out Bins 20, 40, 60, 110 Cu. Ft.
Afterfilter Media Polyester Felt Media Sizes from 72 to 648 Sq. Ft.
•	All models can be housed indoors or outdoors. •	Capacities from 800 cfm to 12,000 cfm. 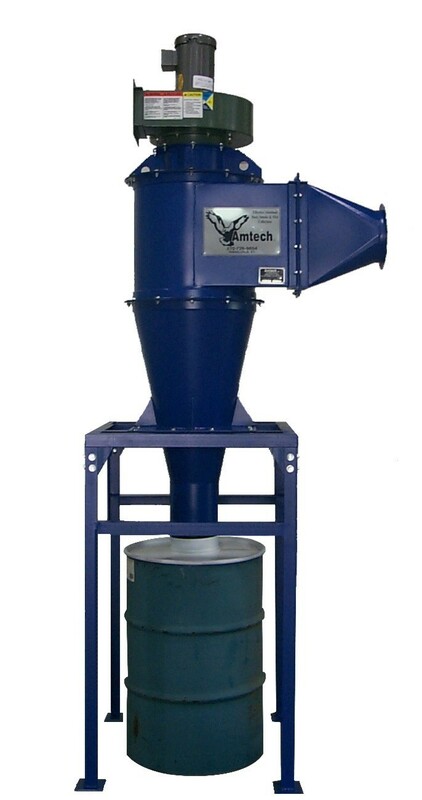 •	Efficiently removes moderate to large sized particles from the airstream through tapered cone design. •	Standard dust storage capacities vary from 7.5 cu. feet to 60 cu. feet, with special hopper configurations available. •	Has no internal moving parts resulting in reduced maintenance. •	Material handling and pre-cleaning.